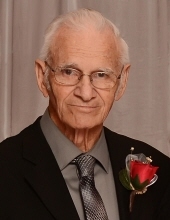 Gerald Dean Ballinger, 85, of Forts Lake, MS went to his heavenly home on Tuesday, December 4, 2018 to be with his Lord and Savior Jesus Christ. Gerald was born on February 22, 1933 in Dixon, MS to the late Thomas Mose Ballinger and Josephine Millings Ballinger. Gerald was a devoted husband, father, and grandfather who was passionate about living life. He had many talents and gifts. He especially loved spending time outside gardening and growing many different types of trees. His family always said he loved to grow to give. In addition to his parents, Gerald was preceded in death by his loving wife of 61 years, Carolyn Ballinger; son, Austin Ballinger; siblings, Thyra Williamson, Queen Ina Hughes, Johniee Dubose Hooper, James Ballinger, Royce Ballinger, and Hilda Crenshaw. He is survived by his children, Audrey (David) D’Orville, Janet (Frank) Smith, Marilyn (Kevin) Kennedy, and Dalton (Geraldine) Ballinger; grandchildren, Andrea (Sonny) Poole, Wesley D’Orville, Shellene (John) Cosman, Caleb (Maria) Smith, Sherie (Brad) Miller, Zeb (Blythe) Kennedy, Ty Kennedy, Jerrica (Tyler) Mims, Jared (Michelle) Ballinger, and Jeremiah Ballinger; great-grandchildren, Brody and Evan Poole, Gracelynn and Asher Smith, Desiree Smith, Macayen and Adara Kennedy, Judah and Justice Miller, and McKenzie Mims; twin brother, Therrel (Doris) Ballinger, and siblings, Jeffolette Watkins and Coy (Ina) Ballinger; along with numerous nieces, nephews, and other relatives and friends. Visitation for Gerald will be held on Friday, December 7, 2018 from 6 p.m. until 8 p.m. at Heritage Funeral Home in Moss Point/Escatawpa, MS. Funeral service will be held on Saturday, December 8, 2018 in the funeral home chapel beginning at 10 a.m. with Rev. Terry Havens officiating. The family will receive friends for one hour prior to the funeral service. Interment will follow at W. R. Clark Cemetery in Forts Lake, MS with Sonny Poole, Frank Smith, David D’Orville, Jared Ballinger, Jeremiah Ballinger, Caleb Smith, Kevin Kennedy, Zeb Kennedy, and Wesley D’Orville serving as pallbearers. To send flowers or a remembrance gift to the family of Gerald Dean Ballinger, please visit our Tribute Store. "Email Address" would like to share the life celebration of Gerald Dean Ballinger. Click on the "link" to go to share a favorite memory or leave a condolence message for the family.